To make your 3, 4, 5, or 6 MP display function correctly and display it's specified resolution you will need to make the following adjustments in Windows XP. At the Desktop on your administrative/navigational display right click. A drop down menu will appear. Left click "Properties". If the display image is grayed, the display(s) must be attached. Right click on the grayed image display. From the drop down list, left click on "Attach". In the lower left quadrant of the Properties window you will see a sliding bar. Move the bar to the right to increase the resolution. Move the bar right until this number matches the resolution number of your display. 4MP and 6MP color displays are set in landscape mode. Landscape mode for 4MP is 2560 x 1600. Landscape mode for 6MP is 3280 x 2048. With the sliding bar to the far right, as far as it will go, If you cannot reach the proper values for your display proceed through the following steps. Left click "Advanced Settings" at the top of the window. Then in Advanced Settings left click the tab at the top named "Monitor or Display". In the Monitor window you will see an item named "Hi modes that this monitor cannot display". This line of text appears next to a "checkable box". This box must be unchecked. If it is checked, uncheck it by moving your cursor over it and left clicking on it. Then click "Apply" at the bottom right of the window to affect this change. Clicking "Apply" in the previous step take you back to the "Display Settings" window. Check the resolution bar to verify this setting matches the specification for your display. If it does not, move the sliding bar to the right until it does. If you still cannot get the resolution number high enough to match your display perform the following. Left click on the "Adaptor" tab, at the top of the "Display Settings" window. The Adaptor window will open. At the bottom right of the Adaptor window you will see a line titled "list all modes for this display". Scroll down through this list until the correct number for your display is presented. Left click on this number to highlight it. Then click apply to affect this change. Clicking "Apply" in the previous step should return you to the display settings to verify your settings are correct. If they are left click "Apply". A window verifying these settings will appear. If they are acceptable click "yes". To make further adjustments click "no" and it will return you to the display settings window. Close the Display settings window when you are done. A system restart is not necessary. Of note, if you are using a 6 MP display in the split screen mode a special process is required. 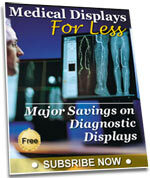 Please contact us for instructions on how to properly adjust the display setting for these devices. You may find some variance in the steps or the naming of various items based on the Windows version you are using or the proprietary version that comes with your PC from the manufacturer. Click here to download a pdf copy of these instructions.